Just a quick post on a tip I’ve learned recently. 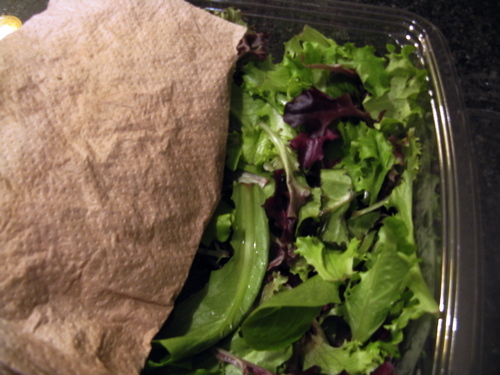 A great way to keep a lot of foods fresh is to put a paper towel in the container with the food. I’ve done this with lettuce – the one pictured had been in my fridge over 2 weeks! I’ve done it with cooked onions and mushrooms, with cilantro, etc. Seems obvious, I guess, that the moisture would be the issue with a lot of food, but somehow I didn’t realize there was such a simple remedy. This entry was posted in Cooking Tip. Brilliant idea Jackie and I am always keeping track of tips so when your mom shared the address of your blog, I bookmarked it immediately. I’ve often used a wet paper towel over veggies in the microwave which seems to provide just the right amount of moisture while reheating or resteaming. Be sure to add any links of YouTube videos you create. Would love more tips on how to roll cakes into a log with minimal cracking!